The CW has released a brand new trailer for the upcoming second season of their hit television series, Riverdale. In the end of the first season, Fred (Luke Perry) was shot by an unmasked man in a diner. In this new trailer, we see Archie (KJ Apa) quivering in despair as he is held at gunpoint. As the trailer plays, we hear Jughead’s (Cole Sprouse) narration. “What if robbery wasn’t the motive? People hold grudges. Think of where we live,” Jughead says in a suspicious manner. Throughout Jughead’s narration, we see quick flashes of Cheryl (Madelaine Petsch) in the hospital by her mother, Archie and Veronica (Camilia Mendes) in the shower together, Jughead kissing Betty (Lili Reinhart) in the rain and what looks to be Veronica walking down the aisle followed by Archie’s mother (Molly Ringwald) winking. You can see the new Riverdale trailer down below. Are you excited for the second season of Riverdale? Sound off in the comments below, and be sure to continue following Heroic Hollywood for all the latest news regarding this series and the rest of The CW’s hit shows including Arrow, The Flash, Supergirl and Legends of Tomorrow. As the town breathed a collective sigh of relief that Jason’s killer had been found out, another terrible crime occurred, in a space that had been considered one of the town’s safest, most innocent places. If Jason Blossom’s murder revealed the slimy underbelly beneath Riverdale’s surface, as we enter Season Two, the shooting of Fred Andrews threatens to plunge the entire town into utter darkness. Based on the characters from Archie Comics, RIVERDALE is from Warner Bros. Television and CBS Television Studios, in association with Berlanti Productions, with executive producers Roberto Aguirre-Sacasa (“Supergirl,” “Glee”), Greg Berlanti (“Arrow,” “The Flash,” “Supergirl,” “DC’s Legends of Tomorrow”), Sarah Schechter (“Arrow,” “The Flash,” “Supergirl,” “DC’s Legends of Tomorrow”) and Jon Goldwater (Archie Comics). The second season of Riverdale premieres Wednesday, October 11 at 8/7c on The CW. I really don’t understand why so many great, independent comics are being ignored by Hollywood executives. 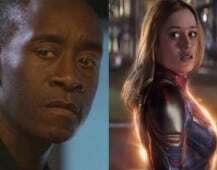 Marvel and DC dominated television in 2016 with the Arrowverse bringing the Legends of Tomorrow into the mix and Netflix adding both Jessica Jones and Luke Cage to their expanding list of original titles. Comic book films also did well in the box office last year, even if the critics weren’t always too happy, so it seems from an investment perspective comic book properties are still a good bet. Independent comics are full of characters and concepts that have the potential to become the next big thing. Fortunately, with Valiant’s recent announcement of an online Ninjak series and FX finally naming a show runner for their Y:The Last Man adaptation, it seems comic fans have a lot to look forward to in the years ahead. Here’s a list of 10 more comics ripe for the silver screen. Click Next to start!